A former University of Rhode Island men’s basketball player recently created a non-profit organization that aims to empower and provide educational opportunities for young African men and women through basketball. Ifeanyi Onyekaba, a senior finance major, left the basketball team prior to the 2015-16 season to focus on his academics. He created Unsung Talent Basketball last June to improve the porous conditions on basketball courts, backboards and rims in his native community of Abuja, Nigeria. At first, Onyekaba told his mother about it and she suggested that he buy food and give it to the rescue mission in Nigeria. Onyekaba also spoke to his friends and former teammates about his ideas and they loved his vision, which led them to doing fundraisers. He then received approval from the Nigerian Basketball Federation in launching a basketball clinic in Nigeria. 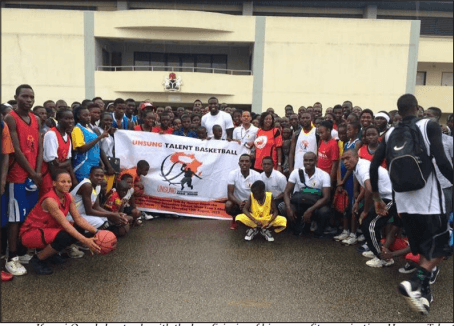 Over 250 students attended the First Annual Basketball camp held on Aug. 7, 2015, in Nigeria. “What stood out to me was half of the kids, they were playing basketball with those shoes and that really hurt me,” Onyekaba said. In addition to fundraising to purchase new backboards and basketball rims, Onyekaba had the idea of creating a shoe drive this year to purchase sneakers for students. Since last June, Onyekaba raised $4,000 through his GoFundMe campaign and bought 240 pairs of shoes and 50 basketballs and jerseys for Unsung Talent Basketball. The Rotaract Club also donated 100 pairs of sneakers to the organization. Onyekaba hopes to take Unsung Talent Basketball to new heights in the future.